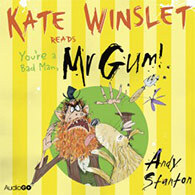 The quirky, silly, and insanely entertaining Mr Gum children’s books, written by British author Andy Stanton, have been re-styled in audio format by Oscar-winning actress Kate Winslet. The series of chapter books, geared toward grades 3-6, detail the devilish dealings of Mr Gum, the hometown baddy in the charming English town of Lamonic Bibber. Combine that villain with a bathtub fairy that doles out wacks with a frying pan, a gingerbread man named Alan with electric muscles, and throw in a few trolls and witches to get an idea of the creative meanderings on which this series takes young readers. Stanton himself had previously recorded audiobook versions of his series, but Winslet has done new audio readings of four installments. The new recording include: You’re a Bad Man, Mr Gum!, Mr Gum and the Biscuit Billionaire, Mr Gum and the Goblins, and Mr Gum and the Power Crystals. In an interview with the BBC’s AudioGo, Stanton talks about his reaction to the acclaimed actress reading his books. “Well, as you’d expect, she has the voice of an angel dipped in honey dipped in kittens’ tears, and her narration is a thing of beauty – it has authority and warmth and clarity. Listening to her is utterly captivating. But with Mr Gum you have to know how to sell the humour too, and Kate does that brilliantly. There’s lots of places where she gets laughs that I wasn’t expecting; or where she goes for a different type of laugh than I would have. It’s really interesting, because I’d already recorded the first three books myself, so I’m constantly comparing my versions with Kate’s. She’s certainly better at doing the voices than I am, and she really makes a meal of acting out the more dramatic parts. I love how she’s thrown herself into the recordings, she’s not afraid to get her hands mucky with my horrible characters and peculiar humour. And it’s just inherently funny to have forced Kate Winslet to say my made-up words like ‘nibblehead’, ‘tungler’ and ‘BLEM!’ If nothing else, I’ve brought a little weirdness into her career. 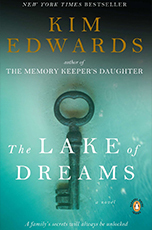 And she’s brought a little respectability into mine,” the author explains.